These skates hold the soul of the demon witch Odette, who traded her soul for eternal youth, transforming into a swan. Residing in the frozen hell of Cocytus, legend has it that Odette made a pact with the stubborn demon queen Odile, allowing her to fall to her preferred circle of hell. 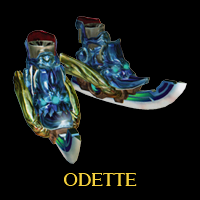 Odette, said to have prided herself on her ice magic abilities, lends the blades of these skates the terrifying ability to summon up the cold. yoshesque: Doing a set amount of damage (750 points) with these skates directly (Wicked Weaves don't count) can freeze enemies. However, enemies like Beloved, Dear & Decorations and Inspired can't be frozen. They also have limited use in protecting Bayonetta against environmental damage such as lava. Apart from that, these are a rather mediocre weapon. 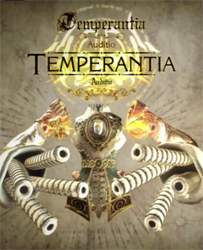 Temperantia, the true embodiment of the Cardinal Virtue of temperance, is often illustrated as an epic giant. Its body rising like a castle, Temperantia possesses two tree-like arms; a composed figure said to illustrate the total reverence in which the Laguna are held by the faithful. When the true power of the virtue of Temperance is laid upon our world, it is said to come as a tornado, capable of swallowing an entire country. Humans are helpless to guess at the impetus behind Divine Will, whether it be anger or happiness, and are left only with prayers and promises of personal temperance if only the heavens should make the storm subside. A giant endowed with six fearsome arms capable of pulverising mountains, those unfortunate enough to fall underfoot of the demon are subject to days-long violent earthquakes. Lacking knowledge, but brimming with brutality, it is said that even the most powerful of conjurers should take heed of the danger this beast presents.